31034 Future Flyers is a Creator set released in 2015. 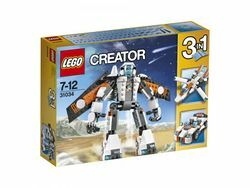 Like many Creator sets, instructions are included to build three different models from the provided pieces, though there are not enough pieces to build all three at the same time. The three instructions provided allow for the building of a car, a fighter jet and the flying robot on the set box. The set includes primarily white, grey, black and orange pieces. There are also transparent blue pieces which are used for lights or windowed areas. Many joint pieces are included for construction of the flying robot, as well as wings for this and the fighter jet. Facts about "31034 Future Flyers"
This page was last edited on 4 May 2016, at 13:37.